Ever wonder what Seaside Heights beaches will look like after an expected beach replenishment project takes place? Borough Administrator Christopher Vaz shared an aerial rendering with Shorebeat this week which provides a glimpse into how far the sand will stretch once the U.S. Army Corps of Engineers project is completed – likely in 2017. 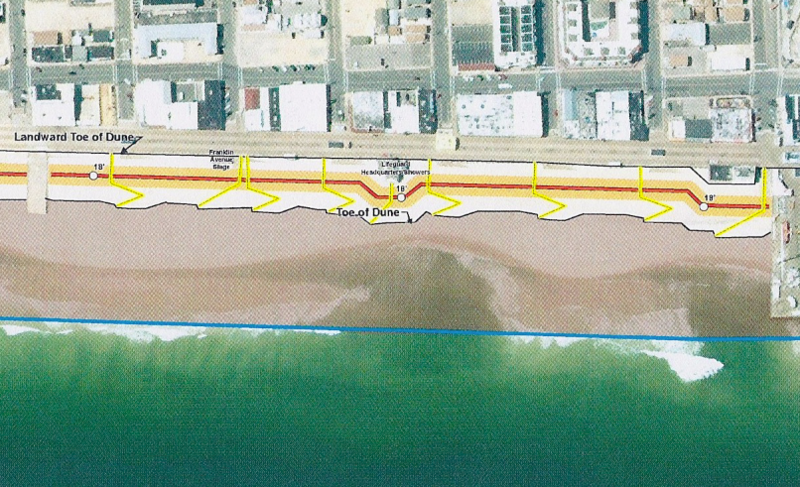 The imagery, produced by an engineering firm working for the borough, uses data from the Army Corps’ construction sheets to paint a picture of large borough beaches will be after sand is pumped onto the beachfront and dunes are built during the project. 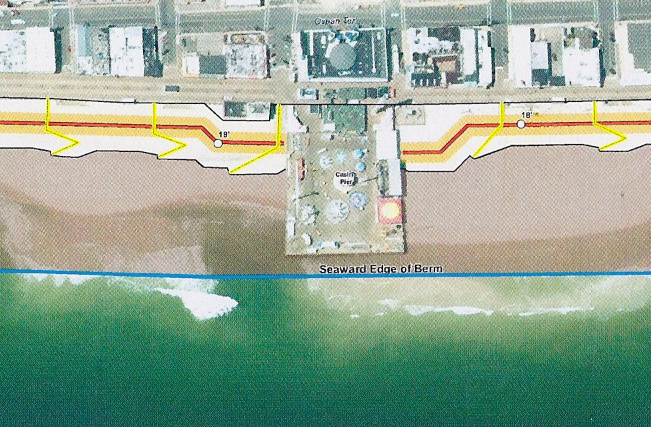 According to the document, borough beaches will be significantly larger – sand will stretch for more than 25 feet past the end of Casino Pier – and sand will now be placed along much of where waves currently break, moving the breakers out farther and producing a larger beaches. 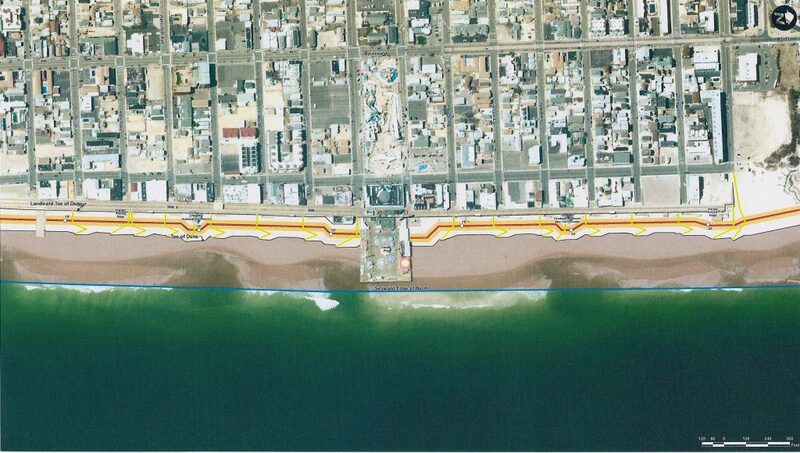 The area of the images shaded in brown will be the future seaward edge of the beachfront sand berm. In several areas, breaking waves can be seen in the shaded area. 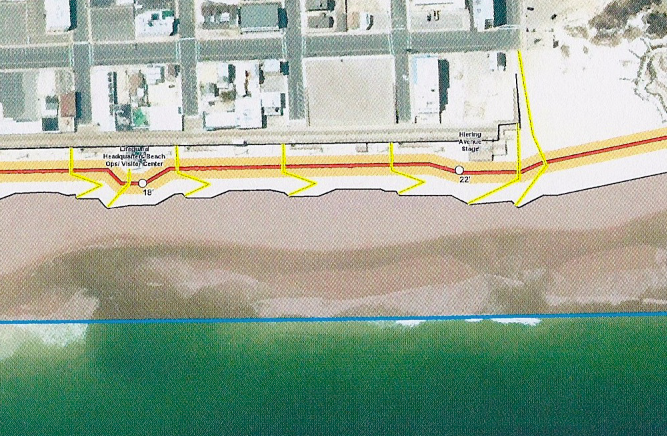 The project, which will be performed along the entire coastline from Point Pleasant Beach to South Seaside Park, is expected to go out to bid within weeks, with a contract award set before the end of the year. Work is scheduled to begin after the new year. Dunes will be construction in front of the present boardwalk and range from 18 feet to 22 feet in height, depending on the area of town in question.